The Edge uses a Fender Stratocaster or a Gibson Explorer through a vintage Vox AC30 amp with a Memory Man echo "which is a real budget echo, but it works really well; it's functional and uncomplicated." He likes "very heavy" strings, ranging from .011 or .012 gauge up to .056. "My Explorer isn't one of the vintage '58s, it's more like a '76, but it's great in that it has a nice top end without that extra raunch and distortion that a lot of players like in a Les Paul; it's like a compromise between a Les Paul and a Strat." He admits to occasionally using a Les Paul in the studio, as well as an Epiphone steel guitar he picked up at Gruhn Guitars in Nashville. "It helps give an 'American' feel to 'Surrender,' on the new album. The Vox amps are like the original Beatles amps, with the original box speakers -- little 12-inchers with a very gutsy middle sound." The Edge is partial to Roland's Chorus 120 amps, because of their "tough, clean sound." 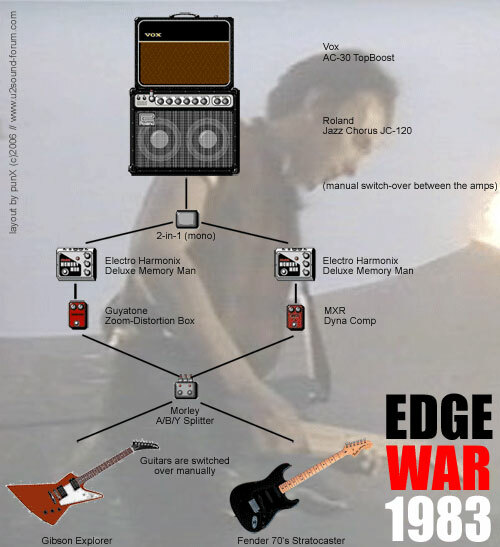 Per "U2 by U2" (published in September of 2006), when it came to 1983's "War" album, The Edge wanted more direct sounds and backed off on the Echo. In the book, he mentions using a Fender Amp to get the tones on "Sunday Bloody Sunday".